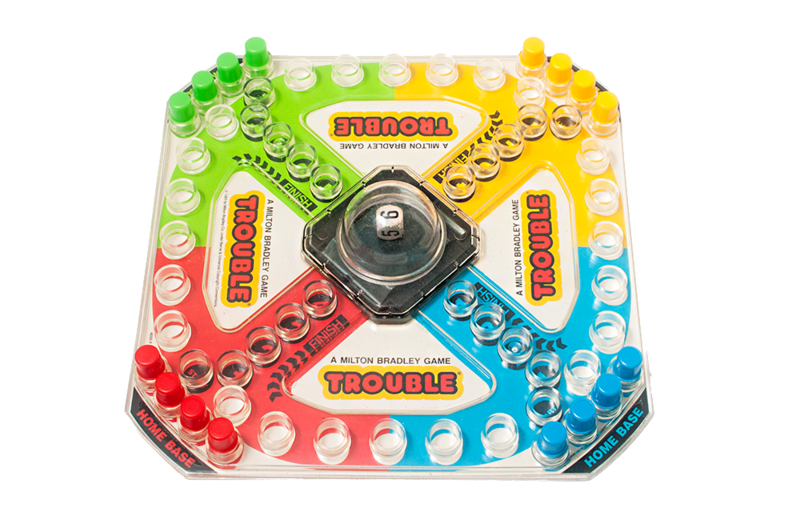 Released in 1965 by Kohner Bros. Inc., Trouble is a simple “roll-and-move” board game for 2 to 4 players. The first player to move all four of his colored pegs around the board wins. Gameplay is straightforward, and strategy is kept to a minimum. The player rolling the largest number typically wins. Trouble’s most notable feature is the Pop-O-Matic – a small, clear plastic dome that houses a single die. Players roll the die by pressing down on the bubble and quickly releasing it. This action causes a flexible sheet of plastic underneath to bend and flex, efficiently rolling the die when it snaps back into place. True to its name, the Pop-O-Matic emits an appealing popping sound each time it is pressed. Besides being fun to use, this setup also prevents the die from being lost over time and effectively curtails any attempts at cheating by improper rolling. Trouble remains a favorite family game-night staple to this day. The game was eventually acquired and marketed by Milton Bradley (now part of Hasbro). A classic version of the game (matching the look of the original 1965 release) is also being sold by Winning Moves. Also known as "The Ultimate Survival Game" in print advertising through the 1970s, Stay Alive is one of those strategy games whose name accurately sums up its overall objective. Released in 1959 by Remco, the Yankee Doodle launch pad propelled a series of toy Atlas and Titan rockets, as well as one of three different satellites, into "outer space".